raise a flag: works from the Indigenous Art Collection (2000 - 2015) presents selected works from a national heritage collection representing First Nations, Inuit and Métis art. raise a flag presents selected works from a national heritage collection representing First Nations, Inuit and Métis art. Housed in Ottawa, managed by Indigenous and Northern Affairs Canada, the Indigenous Art Collection is one of the most important and comprehensive art collections of contemporary Indigenous art in Canada and beyond. In light of and in tandem with Canada’s 150 commemorations, raise a flag represents alternative discourses and uncovers missing narratives from the framework of a national identity. The works in raise a flag focus on recent acquisitions, obtained from 2000 to 2015, which chronicle recent significant national narratives reflecting upon Canadian heritage, diversity and collective memory. The exhibition brochure is available online here. 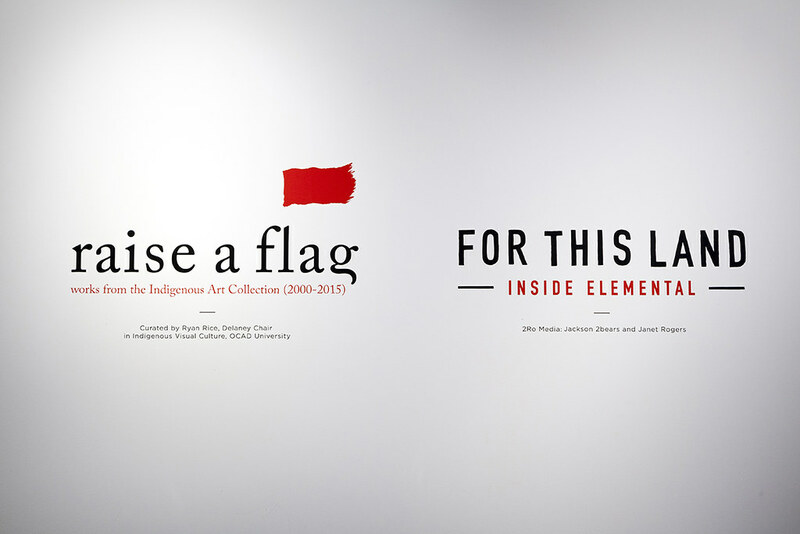 raise a flag is also produced with the support of the Collection of Indigenous and Northern Affairs Canada, courtesy of the Indigenous Art Centre/Collection des Affaires autochtones et du Nord Canada, courtoisie du Centre d'art autochtone; Our Children's Medicine program and HigherMe; the City of Toronto through the Toronto Arts Council; the Indigenous Visual Culture Program at OCAD University; and, the Delaney Family Foundation.